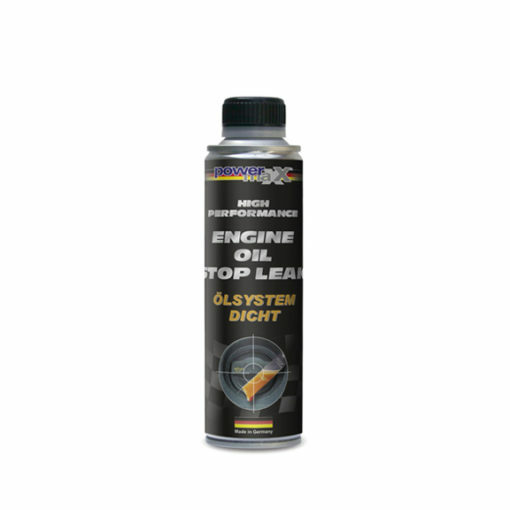 With the Engine Oil Stop Leak, the combination of highly efficient and innovative components rejuvenates the plastic and rubber seals in the oil system and keeps it soft. The oil loss from the seals or piston rings is reduced or stopped, therefore reducing the oil consumption. In addition, abrasion and wear is considerably reduced, the viscosity of the oil is stabilized and works against the oxidation of the engine oil, thereby extending the life of the engine. For use in all 4-stroke- and diesel engines, transmissions, etc. This product is compatible with all commercially available oils on the market. Just add it to the oil system. We recommend an oil system cleaning with the powermaxx Oil System Cleaner before using this product. Please observe the total oil capacity according to the manufacturer’s specifications.